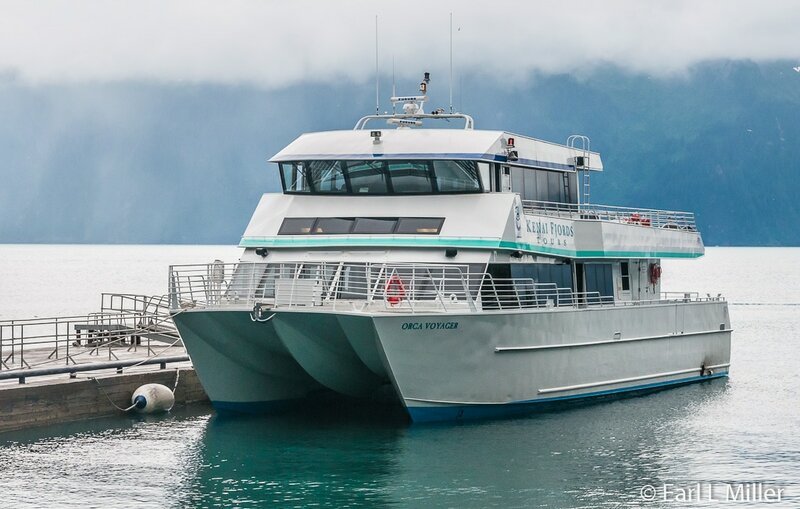 With the largest cruise fleet in South Central Alaska, Kenai Fjords Tours has become popular for the variety of day cruises they offer. Altogether, they provide five different trips at varying prices and lengths. 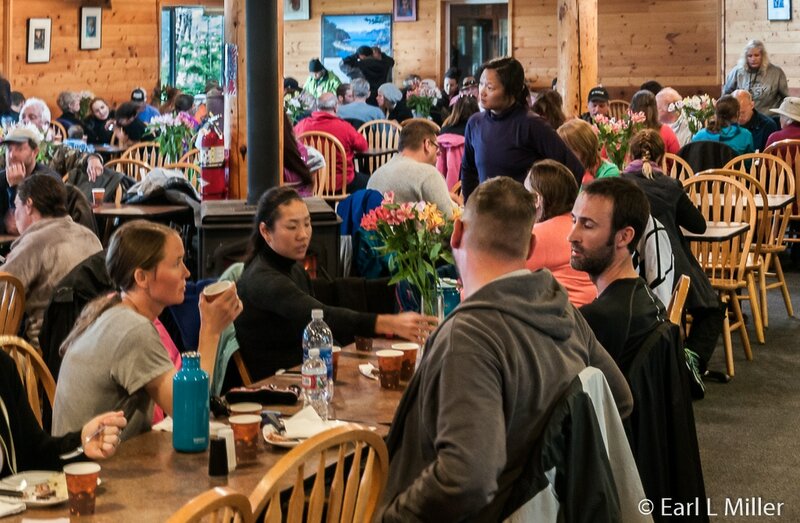 It’s a diversity attracting families with different budgets and time schedules eager to see wildlife and one or more glaciers. Captains, on each boat, provide narration about Seward’s history, local life, and geography from their own personal experiences and point of view. All are certified through the National Association of Interpretation. Their average time on the water, though not necessarily in Alaska, is 12 years. To make it easier to hear their presentations, LCD monitors, in conjunction with an excellent sound system, hang at various positions around the boat. Passengers on national park tours see at least one tidal glacier as the catamaran comes within a quarter mile to a half mile from it. This often includes the opportunity to see calving as a huge chunk of ice splinters off and splashes into the water below. Close to these glaciers, you’ll see harbor seals hauled out on the floating ice. Sea otters are also commonly found. If you’re lucky, you may spot Dall porpoises and several different species of whales. At the rookeries, puffins, murre, and kittiwakes are among the common birds seen. Since passengers are anxious to observe wildlife, captains constantly watch for marine mammals. They stop the boat when they spot marine life so passengers can observe the animals. They also pull the boat close to areas where sea lions, seals, and birds reside. After reviewing the many choices, we decided on the National Park Cruise with a stop at Fox Island. 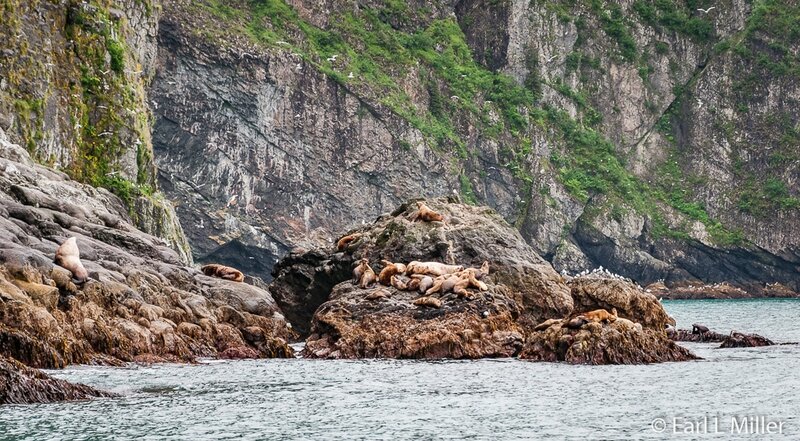 It’s Kenai Fjords Tours' most popular wildlife and glacier cruise. We found the Orca Voyager different from the Stan Stephens boat in Valdez. For example, this boat had leather seats instead of cloth. The Chicken Caesar wrap was filling but not a hot lunch. Doors on the Orca Voyager swing open rather than slide. Seating was around tables rather than in rows. A major plus on our Kenai Fjords Tours cruise was the opportunity to follow the active navigation map on the monitors in Orca Voyager’s cabin. 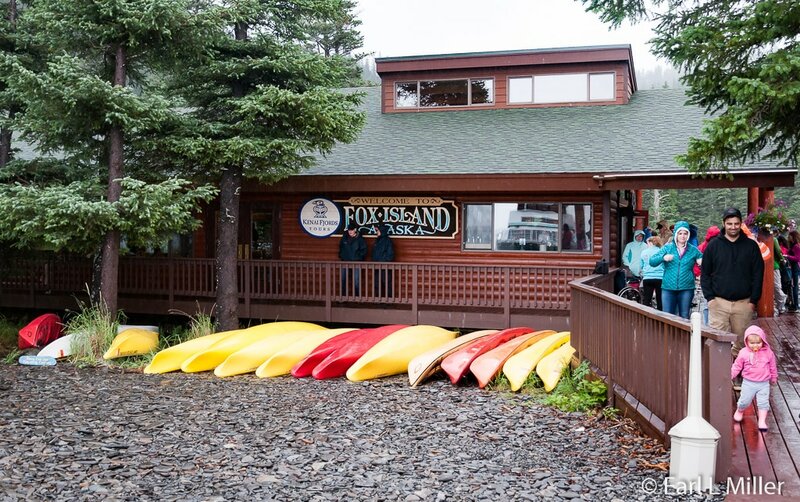 Another was the stop at Fox Island to enjoy the complimentary buffet and ranger presentation. If you forget your binoculars, they do rent them. Leaving the cruise dock, we headed into the waters of Resurrection Bay and further into Kenai Fjords National Park. Eric Simpson, our captain, explained the tour’s itinerary changes daily depending upon the weather. However, looking for wildlife is a big part of every cruise. Eric explained that before March 27, 1964, Seward’s shoreline had been the home to fish processing plants, warehouses,Texaco and Standard Oil tanks, and a small boat harbor. It was the heart of Seward’s economy. At 5:36 p.m. that day, an earthquake dropped the entire shoreline into Resurrection Bay. It was followed by a Tsunami, 25 minutes after the quake, that mangled what was left. The wave was 30 feet tall when it hit Seward and advanced 9/10ths of a mile inland. Today's passengers still view destroyed dock pilings and other remnants even though the town was quickly rebuilt. In 1965, Seward received the All American City award. Leaving the harbor, we saw an immature Bald Eagle. This species of eagle is the second largest bird in North American and has a wing spread between six to eight feet. Mature birds are territorial, coming back year after year to the same spots on land. We passed the Fourth of July Shipyard which is touted as the largest facility of its type north of Seattle. The boat then cruised by the Seward Marine area. In the old days, the town brought boats here and had a giant picnic on the Fourth of July. Just outside the breakwater and in line with the coal loading facility was a flock of seagulls on the water. 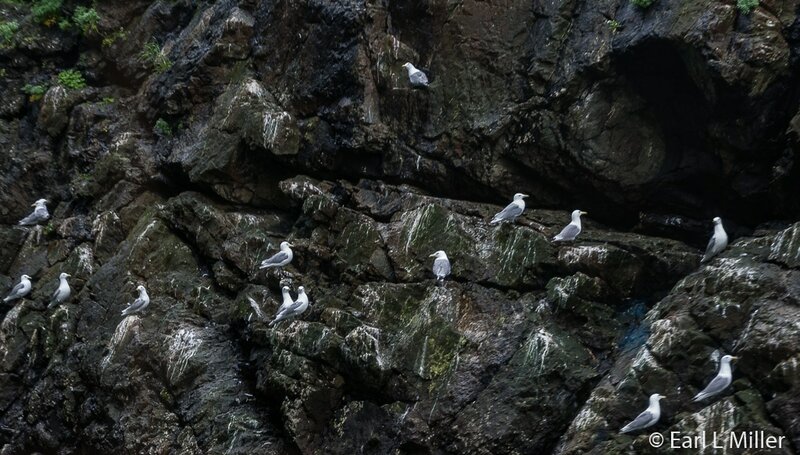 The Black-legged Kittiwake and slightly larger Glaucouse-winged gulls are the gulls that were most visible. The Orca Voyager hugged the shore for some coastal cruising. The coast's east side is the northernmost entrance of a national rainforest. Spruce and hemlock were very visible. Looking up from them, passengers could see an alpine tundra with its ice, rock, and snow on top. As the boat continued, it was possible to see another eagle at 11 o’clock and one at nine o’clock. Eric advised that they mate for life and live almost 20 years. Eighty percent of the eagle diet is fish. Since they have incredible eyesight, they spot their prey at great distances. They also dine on carrion, birds, and small mammals. We passed 720-acre Thumb Cove State Park which is located nine miles south of Seward on the east side of Resurrection Bay. Its most dramatic features are Porcupine, Spoon, and Prospect Glaciers which tower above the park. The Cove is a favorite spot for recreational boaters. Sportsmen enjoy camping on its beach or renting its two public use cabins. Fishing for salmon during their runs is also popular. Across from the state park is Caines Head State Recreation area . It’s the home of North Beach, a very popular camping area with a ranger station, and South Beach, another popular headland. In between lies what was formerly Fort McGilvray. 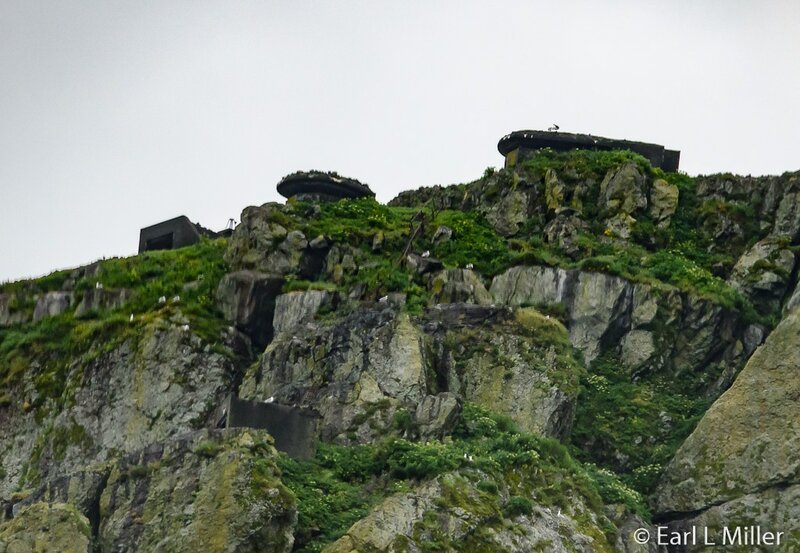 The fort was part of the World War II Seward Harbor Defense system to protect against the Japanese. It had seven miles of roadway, five barracks housing 65 men each, one officers’ quarters, and a mess hall. Approximately eight million dollars went into its construction. Eric pointed out a distinct break in the evergreen trees where 6" gun placements had been located. These had replaced the 155mm guns. One of the practice targets of the 155mm was the spit off Fox Island. The 6" guns were never fired. As the boat cruised into Humpy Cove, passengers saw another World War II sight, “The Iron Doors.” That structure was part of a former searchlight center mounted on railroad tracks. It was used to light up Resurrection Bay’s narrowest point. Six men lived in barracks about 100 yards north of the concrete structure. You can still make out its form. Orca Voyager then cruised along a number of islands in the bay. Before long, we spotted our first marine mammal, a Humpback whale. He showed passengers his back as he headed steadily north. Watching this one, you could see it blowing. The Ghost Forest soon appeared. During the 1964 earthquake, salt water engulfed the forest destroying the trees. We headed to Admiral Cove at the end of Cape Resurrection. That’s when the wildlife became more abundant. We saw two Fin whales and a Humpback whale at a distance. 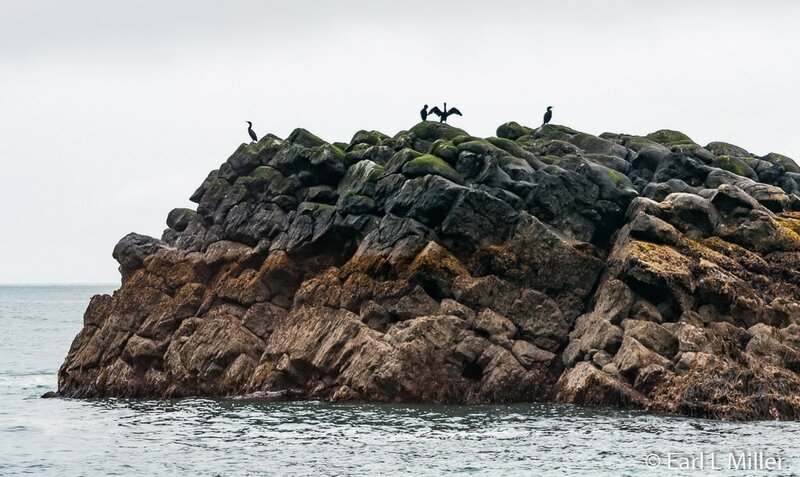 At Cormorant Rock, the boat approached a large bird rookery. 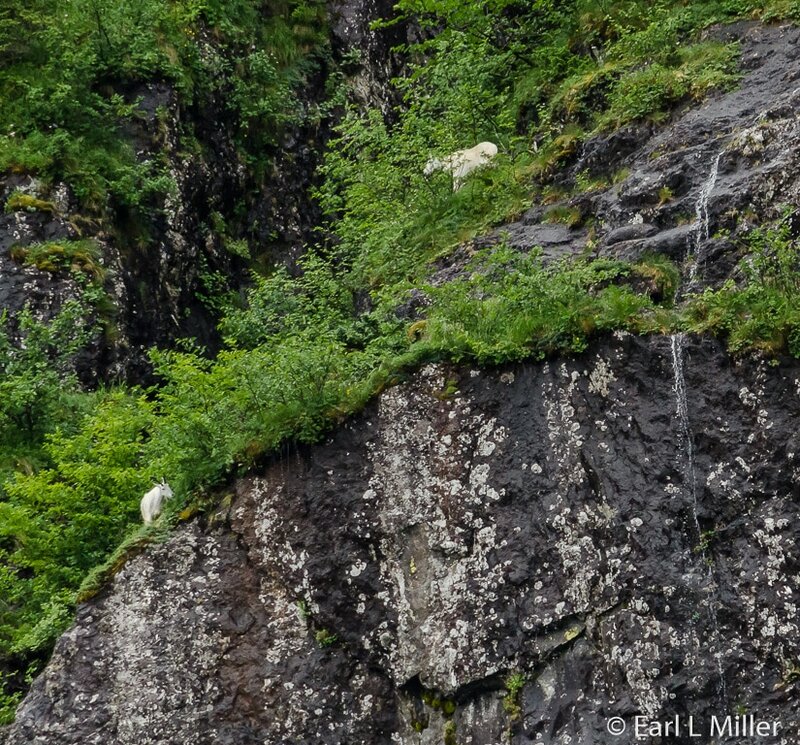 On top of the rookery, a couple of mountain goats could be seen climbing the jagged cliffs as Dall sheep grazed on top. Our boat cruised along several rookeries then circled the Cove. 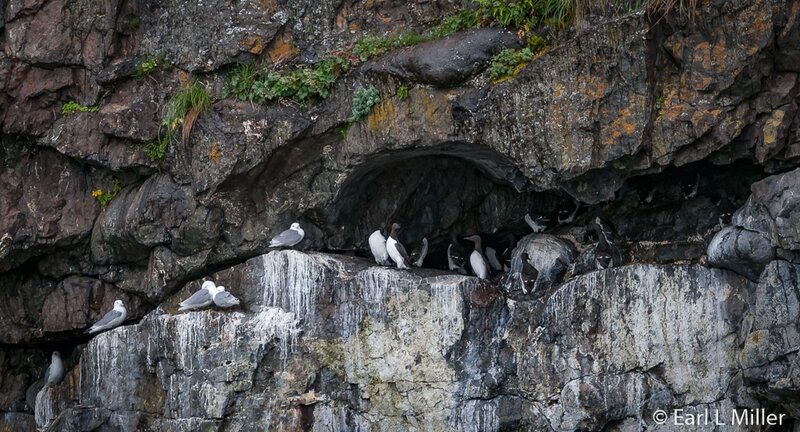 It was loaded with Common Murre and resting Steller sea lions. Several eagles mingled with the cormorants on the outcroppings waiting for a tasty bird snack. Some Horned and Tufted puffins enjoyed themselves in the water. Cormorants, like puffins, are diving birds that swim in the water. Unlike the puffins, they have no oil in their feathers so they need to dry out by standing on the rocks. 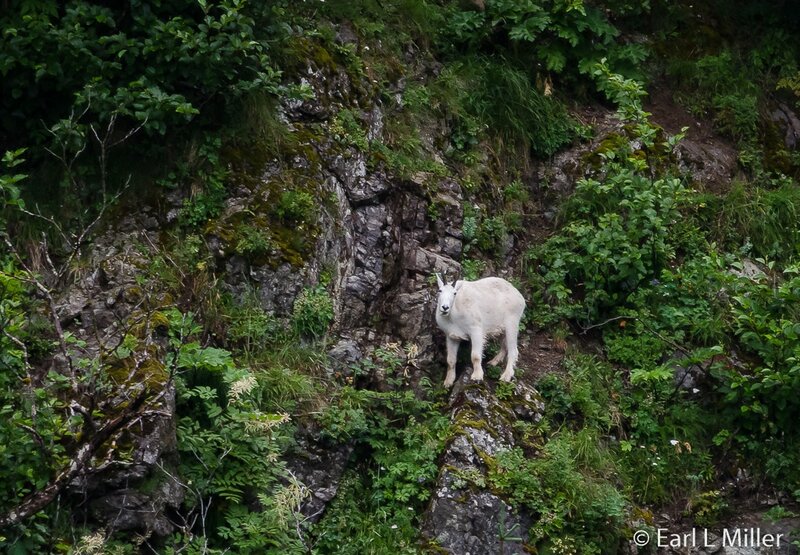 As our boat circled the cove, a mountain goat could be spotted down low. 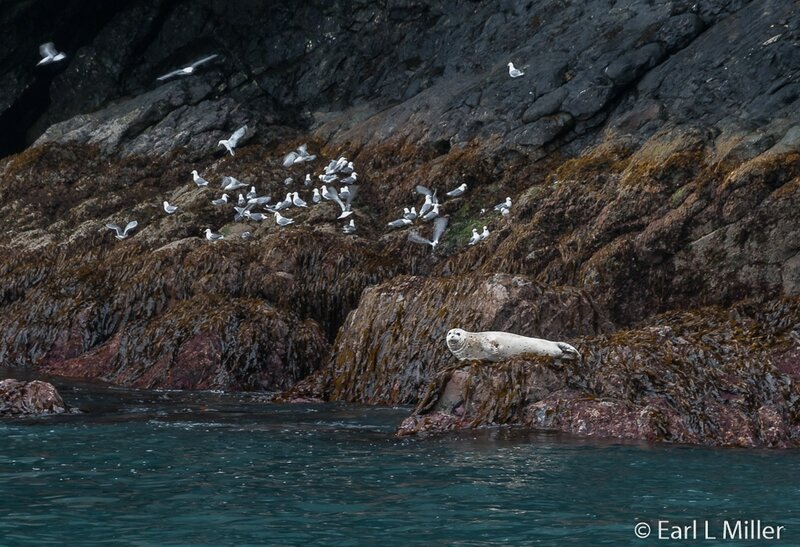 We also saw Harbor seals as the outcroppings provide a critical place for them to haul out. When they dive, their lungs collapse and they use the surplus of oxygen in their blood. Photographers on the boat were fortunate when a lone Humpback whale drew close enough to be photographed. Three more Humpback whales, none particularly active, were spotted at a distance. Eric said that the waters we were now in are among the most productive since a large amount of plankton, which are the bottom of the food chain, exist here due to lots of daylight and the cool water. The fish feed on these and the whales dine on the fish. It is the plankton which gives the water, we were now in, its greenish color. 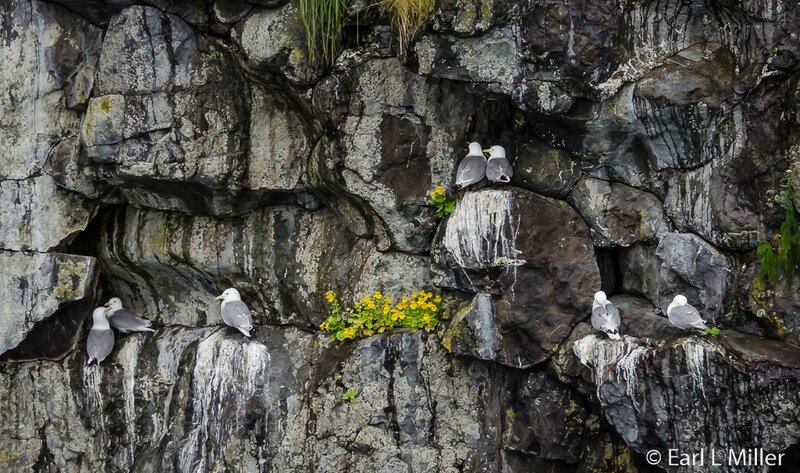 Passengers couldn’t help spotting lots of kittiwakes at Barwell Island. During World War II, troops also stationed here. 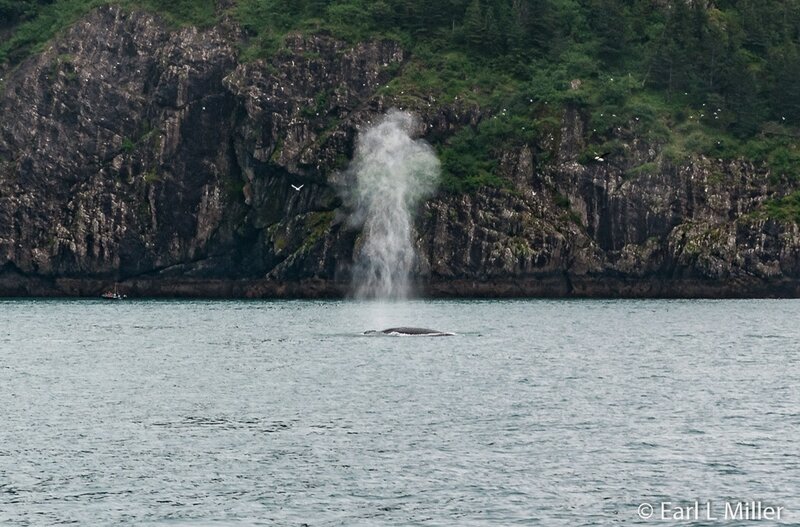 Leaving the island, we saw another whale blowing. Starting to enter the Gulf of Alaska, the boat ran into choppy water with numerous swells. Unfortunately, on this cruise, our luck with good weather ran out. From the time we left the dock in Seward, fog covered much of the landscape making it difficult to photograph. After the Orca Voyager crossed over Harding Gateway and went into the Gulf of Alaska, our vessel was really bouncing around with the waves spraying water over the bow and sides of the ship. Going out into the open waters of the Gulf, for even part of the time, made several passengers, but not us, seasick. It rained much of the day making conditions even worse. During these rough conditions, the captain ordered everyone to come inside until the storm passed and the water calmed. 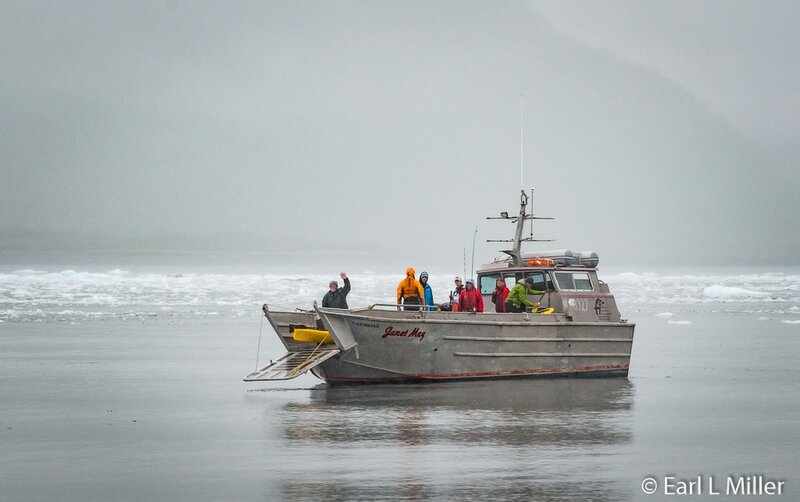 The boat finally returned to smoother waters once inside Resurrection Bay’s mouth. We passed an island with a weather station. At Harding Bay, we spotted a family of Orcas also known as "killer whales." Orcas are the largest members of the dolphin family. I didn’t see them, but Earl was able to photograph them from their sides and back. Eric advised passengers that Orcas are the apex predator and top of the food chain. Resident Orcas eat fish while the transients dine on marine mammals. The two are separate species that have never fed or bred together in a thousand years. Orcas swim in pods as family groups. They stay with their mothers all of their lives. In the wild, they average 60 to 70 years. Orcas spread out to catch a school of fish then come back together. Both species, resident and transients, travel up and down the coast. Eric advised that seeing Orcas was a matter of chance. “Sometimes we don’t see them for weeks,” he said. Staff then served lunch. Chips, a granola bar, and a freshly baked chocolate chip cookie accompanied the Chicken Caesar Wrap. It was filling and tasty. The Orca Voyager traveled along the Aialik Peninsula until it stopped at the Aialik Glacier, the largest glacier in Aialik Bay. It’s a retreating tidewater glacier (descending into the ocean) that’s part of the Harding Ice Field. However, it’s continually being renewed by snowfall. The snow becomes compressed, turns into ice, and slides down the mountains by gravity into the sea. It grinds away rock as it slides. When the ice calves away, primarily in May and June, it turns into an iceberg. Eric announced that it takes 100 years to form a snowflake into an iceberg. We also passed Pedersen Glacier. It has receded throughout the 20th century exposing Pedersen Spit and Pedesen Lagoon. In the 1980s, the lagoon was designated as the Pedersen Lagoon Wildlife Sanctuary. Sometimes this cruise goes to the Holgate Glacier instead of the Aialik Glacier. Holgate is a retreating tidewater and mountain glacier that’s one of the smallest in Aialik Bay. It’s popular because of its calving. While at the Aialik Glacier, staff grabbed some glacial ice then passed it around. Unfortunately, at this glacier, photography was very difficult because of the severe fog. 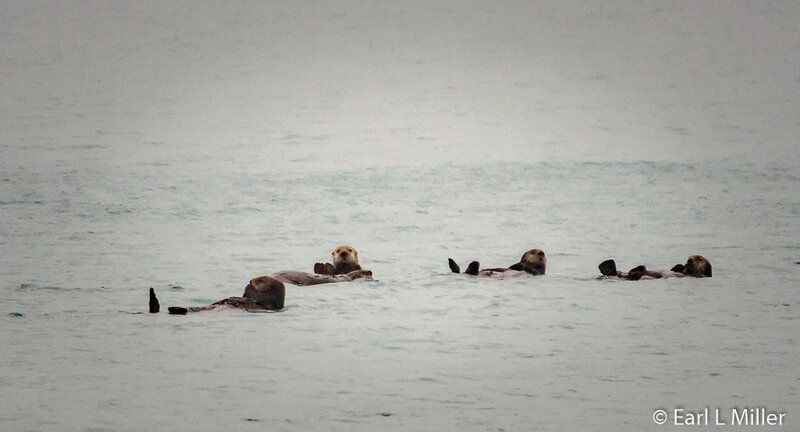 We stopped at Holgate Head to admire a raft of six or seven sea otters. Otters, the largest members of the weasel family, have the densest fur of any mammal. They have a very high metabolism requiring them to eat from one fourth to one third of their weight daily in the wild. Their very powerful jaws bite with the force of a black bear. This helps them crush clams, mussels, urchins, and octopus which are some of their favorite foods. 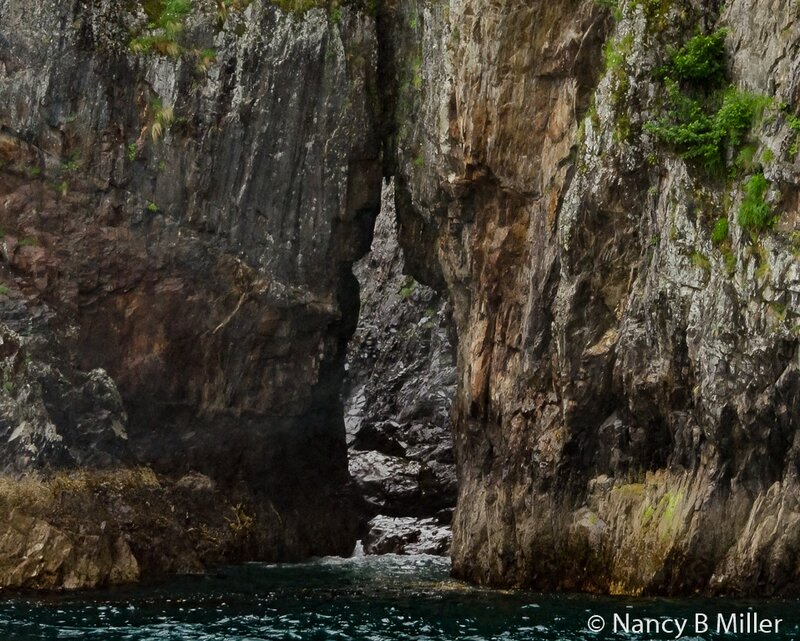 At Matushka Island, lots of Horned and Tufted puffins could be spotted flying around. Nearby was another Humpback whale. Eric informed the group that the Humpback calves drink 100 gallons of milk a day and gain 100 pounds in a day. They swim with their mothers for one to two years but don’t maintain a permanent relationship. 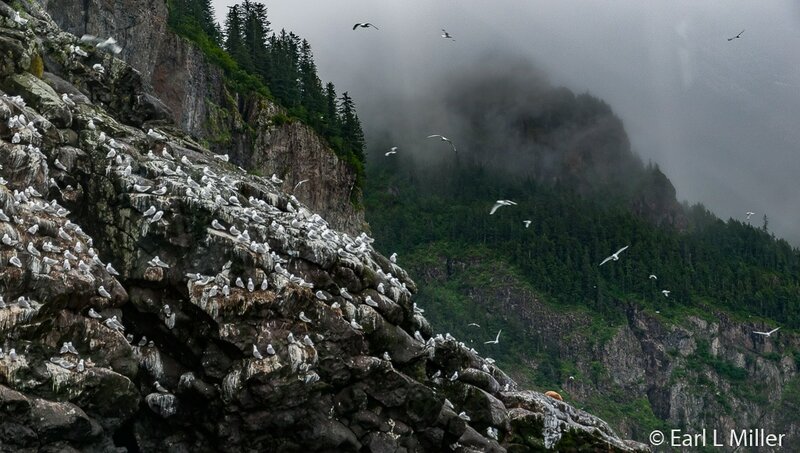 The Chiswell Island group, the boat’s next stop, is part of the Alaska National Maritime Wildlife Refuge and is home to lots of murre, cormorants, and puffins. All of these birds dive deep for fish while seagulls dive one to two feet at most. The boat pulled close so passengers could watch the action. Two Humpback whales, that actively blew a few times, were also in this area. We saw a crack between the rocks called Hole in the Rocks. My only regret was that Eric did not announce it ahead of time to allow for photography that wasn’t rushed. The boat also passed No Name Island where Humpback whales are sometimes seen but not this time. Leaving the Chiswell Islands, our captain pointed out a very active Humpback. Orca Voyager then headed to Fox Island passing several rugged islands protecting Resurrection Bay. We also went by Bear Glacier, a retreating Piedmont glacier that terminates on land. It marks the beginning of Kenai Fjords National Park from the east. At 13 miles long and 16 miles wide, it’s the largest one on the Kenai Peninsula. Those who look carefully at this glacier spot a stripe coming down its center. This medial moraine reveals the glacier was previously made up of more than one ice flow. All day cruises make a stop at this site. The boat finally reached Fox Island. It was named because of the fox farms located here in the early 1900's. The islands were natural pens for the animals. All that was needed were a few mated pairs and a sturdy corral. The farmer fed the foxes fish, sea lions, and seals he had harvested. When the furs were ready and the foxes were eating in their corral, the farmer would close the corral gate and shoot them. Fox pelts were worth $100 each during the early 1900's. During 1918, Alaskan artist and author, Rockwell Kent, lived on Fox Island and painted much of the area. 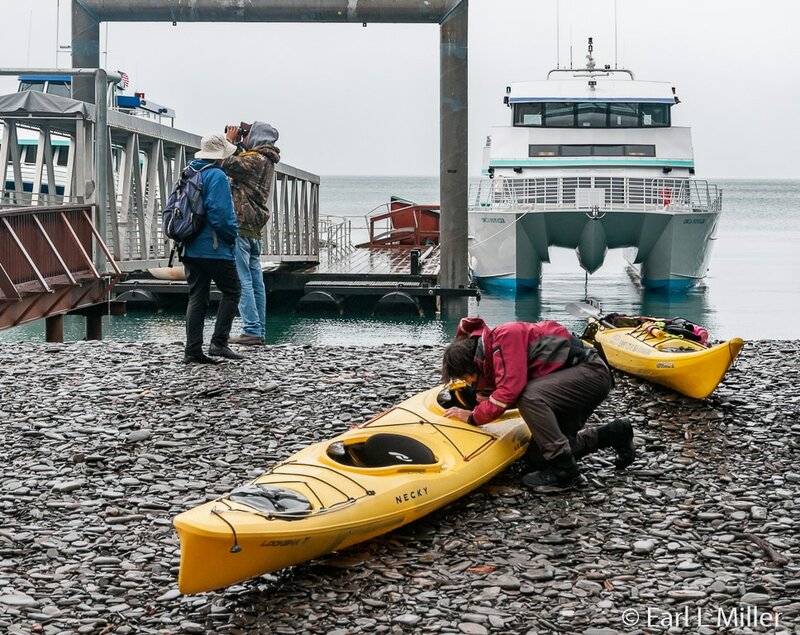 The island today is a great stop for kayaking, has a gift shop, and is the site of Kenai Fjords Tours’ complimentary prime rib/wild Alaskan salmon buffet. Besides meat and fish, passengers are offered green beans and carrots, salad, mashed potatoes, dinner rolls, and cookies. Lemonade and coffee are complimentary. During dinner, Ranger Chad talked about the “Power of Nature.” Since 2016 was the national park system’s centennial, he mentioned that there are 411 national park units with at least one in every state. He defined the various types of glaciers then gave a history of the area. The early Aleut people crossed into Alaska 4,000 years ago. They understood the seasonal cycles and moved inland to protect their homes. The Aleuts transmitted their culture through plays, dances, and songs. In the mid 1750's, the Russians arrived and stayed after they discovered sea otter pelts, a “soft gold.” They killed thousands of otters putting them into severe decline. In the mid 1850's Russia could no longer support their colonies so they sold Alaska in 1867 to the United States for two cents an acre. In 1911, the otter was the first mammal to be protected internationally by treaty. Ranger Chad also informed the group of the effects of the 1964 earthquake which caused Seward’s port to fall into the sea. The tsunamis, which followed, lifted up 40 ton rail cars and slammed them into the mountain. After the talk, the group had a short time to stroll around the grounds or stop at the gift shop for souvenirs before boarding the boat for the return trip to Seward. We arrived back at 6:15 p.m. It had been a long and tiring day but, definitely, the best opportunity of our three cruises for seeing wildlife. The 8-1/2-hour national park cruise travels 120 miles round-trip. It runs May 27 through August 17, leaving at 10:00 a.m. and usually arriving back at the docks at 6:30 p.m. Price is $198 for adults and $99 for children (ages 2-11) plus taxes and port tax fee. This Alaskan refuge’s 2,400 islands, headlands, rocks, islets, spires, and reefs have a total area of 4.9 million acres of which 2.64 million acres are wilderness. It’s well known for its abundance of seabirds. About 75% of Alaska’s native marine birds, around 55 species, use this refuge. AMNWR also provides nesting habitats for an estimated 40 million seabirds representing 80 percent of all North American seabirds. Sea lions, seals, whales, and sea otters are also found here. 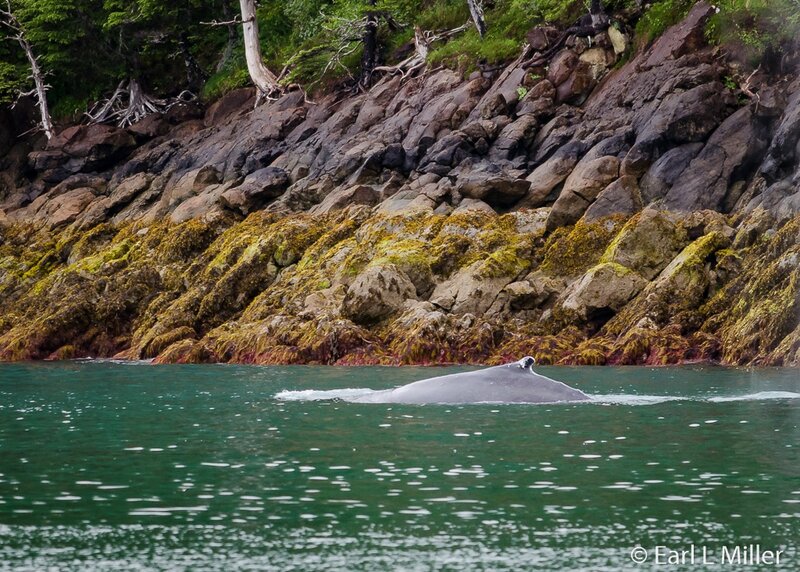 Spanning 601,839 acres is Kenai Fjords National Park. The only way you can explore most of this park’s incredible beauty is by boat or airplane. Snow and ice cover 60 percent of its acreage with Harding Ice Field lining its edge. As numerous tidewater glaciers pour down from Harding, they carve valleys filled with seawater. The result is a series of scenic fjords and icebergs the size of small houses. The park includes thee main areas which are Exit Glacier, Harding Icefield, and the coast. You can access Exit Glacier by automobile from Seward by a spur road off the Seward Highway. It’s a half mile wide river of ice. To learn more, go to my August 14, 2016 article from Seward to Anchorage. Located in the Kenai Mountains, Harding Icefield, a sheet of ice covering more than 700 square miles wide by up to one mile thick, is one of the park’s most distinctive features. Harding, at 30 miles wide by 50 miles long, is the largest ice field within our country’s borders. It’s one of only four remaining ice fields in the United States. Formed during the last Ice Age, more than 20,000 years ago, it has spawned more than 38 glaciers with many descending directly to sea level. Its retreating ice has also carved several deep coastal fjords. The ice field was named after President Warren G. Harding. 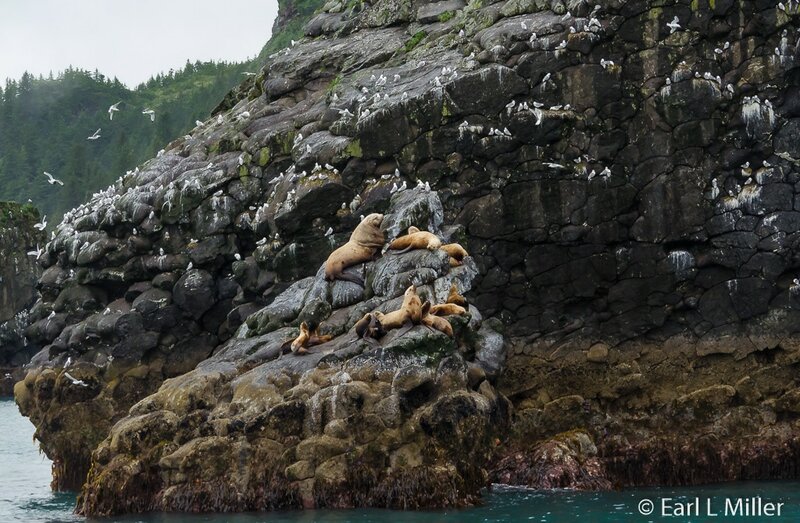 The rugged coastline includes Seward as well as beautiful tidewater glaciers and lots of marine life. The best way to view this is on one of the day cruises leaving from the marina. As more than 191 species of birds have been spotted, the park is a bird watcher’s heaven. 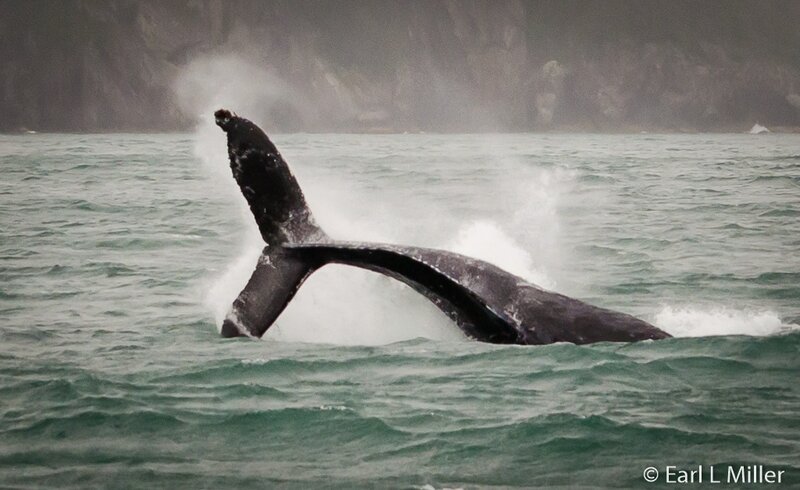 Its waters are full of such marine mammals as sea otters, porpoises, sea lions, harbor seals, and various whale species. Cruisers, who keep a sharp eye out on land, sometimes glimpse black and brown bears, beavers, coyotes, mountain goats, river otters, moose, gray wolves, and wolverines. Activities cover a lot of sports for roadside and back country visitors. These involve everything from kayaking and camping to hiking, flightseeing, and mountaineering. For those with more passive interests, boat tours, ranger programs, and beach combing are available. Kenai Fjords became a national monument in December 1, 1978 under Jimmy Carter. This did not please the citizens of Seward whose economy was dominated by fishing, timbering, and a commercial port booming with activity. The city passed two resolutions condemning the creation of a national monument. Congressional debate about how the lands should be designated dragged on for 18 months. On December 2, 1980, Carter signed the Alaska National Interest Lands Conservation Act into law making Kenai Fjords Alaska’s seventh national park. Within five years, park visits became a crucial part of Seward’s economy. The two City Council resolutions were rescinded opposing the park’s creation. A few years later, the Council requested that the park be expanded. The company’s multihull catamarans are 95 feet long with multi-level, walk-around decks. They, hold up to 150 passengers with seating for four people at tables. The boats have restrooms, are nonsmoking, and are accessible to guests with limited mobility. To allow extra time for stops to photograph wildlife and glaciers, all vessels have fast cruising speeds. Passengers can sit inside the heated viewing areas and observe the scenery through giant picture windows. If they prefer, they can stand outside on the decks. However, when the water is rough, which it can be in the open waters, everyone is called inside. Kenai Fjords Tours’ literature warns passengers to take seasickness precautions, and it is wise to heed these. At least one meal is included in the cruise fare. What you’ll receive depends on the length and cost of the trip. Lunch on the boat consists of a Chicken Caesar wrap. A snack bar is also available on all vessels. 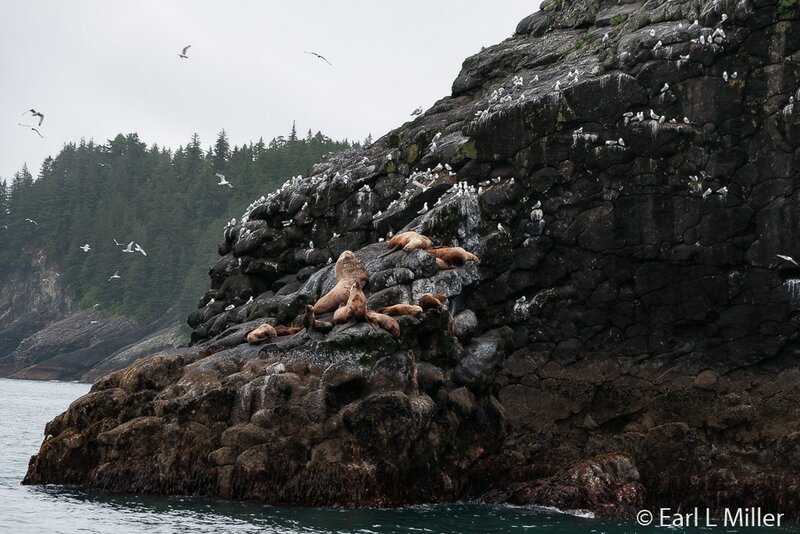 The trips to Fox Island include a wild Alaskan salmon and prime rib buffet combined with a national park ranger talk on subjects pertinent to the area. For children ages 4-12, a national park ranger program is offered. Some tours can be combined with an overnight trip to the Kenai Fjords Wilderness Lodge on the island. Beer and wine are available at Fox Island and on the boats for an additional cost. All meals are subject to change based on the fleet schedule. Vegetarian meals are by request only while gluten free diets cannot be accommodated. A meal can be upgraded by adding a ½ pound of chilled Alaska King Crab for $14.50 when booking or at $17.50 when checking in. No discounts are provided for refusing meals. Kenai Fjords Tours provides complimentary off site parking in Seward. The company also runs a courtesy shuttle from the off site lot and nearly all of the local hotels. Ask about this when you are booking. On arrival at their office, inquire about their complimentary wildlife guide. Fares differ depending on the tour. A city sales tax of 7 percent and a port tax fee of $3.50 are added to all rates. Our cruise was one of three National Park Tours offered. All provide an in-depth experience of Kenai Fjords National Park’s wildlife and alpine and tidewater glaciers. They also cruise through the Alaska National Wildlife Refuge. Where ours stopped at Fox Island, the shorter cruises do not. Staff serves the Chicken Caesar Wrap lunch on each boat. A six- hour cruise leaves the docks at 8:00 a.m., travels 100 miles round trip, and returns at 2:00 p.m. It runs daily May 21 through September 4 then on September Sundays, the 10th and 17th, 2017. Its price is $159 for adults and $79.50 for children (ages 2-11) plus taxes and port fee. The other six-hour cruise departs at 11:30 a.m., travels 100 miles round trip, and returns at 5:30 p.m. It runs from May 6 through September 30. Fare is $159 for adults and $79.50 for children (ages 2-11) plus taxes and port fee. The company’s longest cruise, traveling 150 miles, is the nine-hour Northwestern Fjords Tour. It’s the only one that reaches Northwestern Fjords, home to both tidewater glaciers and several alpine glaciers. The trip also includes Alaska Maritime National Wildlife Refuge. Breakfast consists of a fruit cup and cinnamon rolls with a Chicken Caesar Wrap served for lunch. It doesn’t stop at Fox Island. It cruises June 10 to August 27 with a departure at 8:00 a.m. and return at 5:30 p.m. Adult and children’s fares are $195 per person (ages 2-11) plus a port fee and taxes. The cruise line normally does not recommend this tour for children. Instead, it suggests shorter cruises for youngsters. 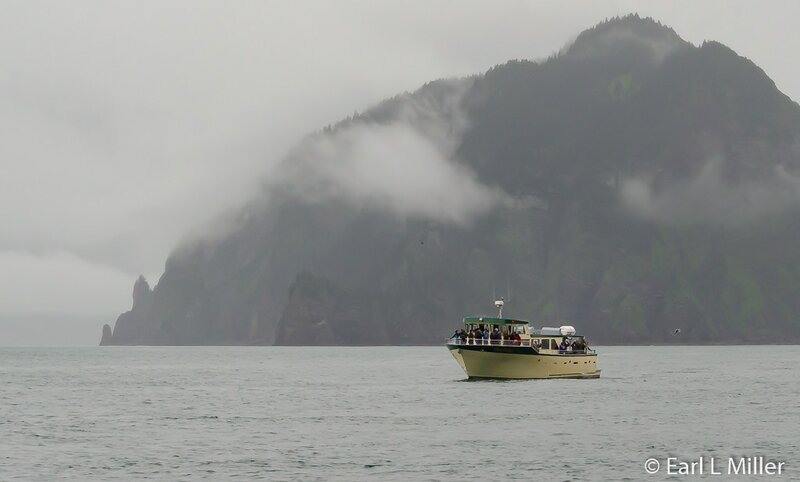 DETAILS ON KENAI FJORDS TOURS' SHORTER VOYAGES. The company also offers three shorter tours. One occurs in the spring while the other two run during the summer. All travel 50 miles. The four-hour Grey Whale Watch searches for California Gray whales who have migrated more than 5,000 miles north from Baja, California. They pass by the mouth of Resurrection Bay headed for Alaska’s Bering and Chukchi Seas. Passengers are served a complimentary chicken wrap lunch. These cruises, which depart at noon, started March 14 and run through May 19. Fare is $79 for adults and $39.50 for children (ages 2-11) plus taxes and port fee. The 3-1/2 hour Fox Island Dinner Tour cruises past Resurrection Bay’s shores to see Bear Glacier on the way to Fox Island. 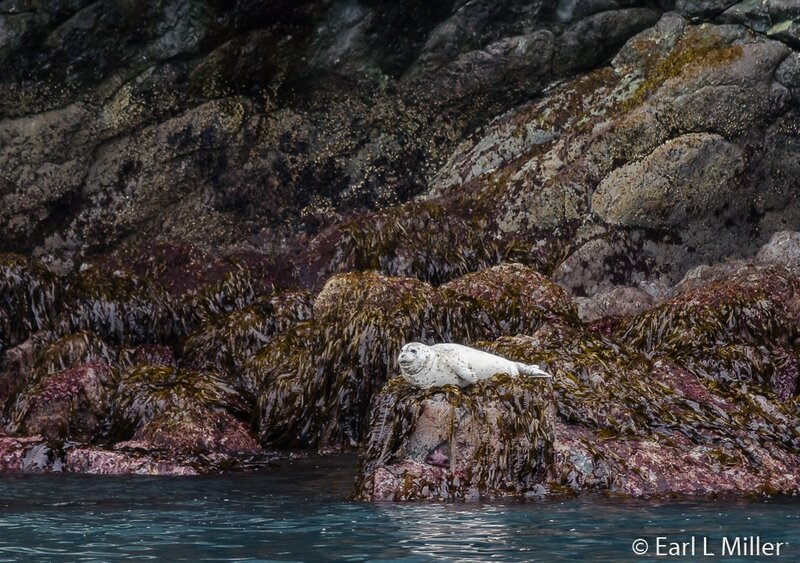 Guests have opportunities to see puffins, cormorants, whales, and sea otters. It departs at 5:00 p.m. and returns to Seward at 8:30 p.m. after feasting at the salmon/prime rib buffet. 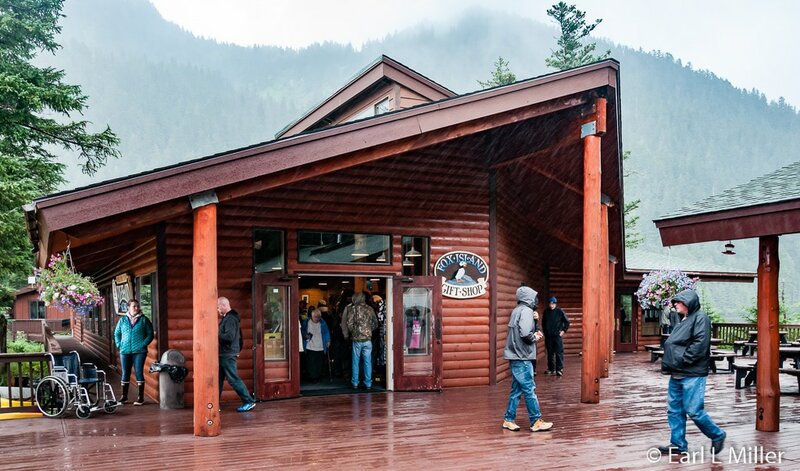 This allows time for families to enjoy other activities in Seward the day of their cruise. It occurs from June 10 to August 13. Fare is $89 for adults and $44.50 for children (ages 2-11) plus taxes and port fee. 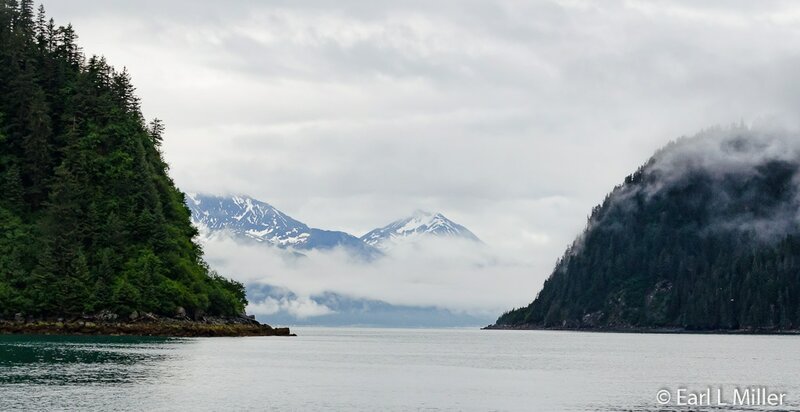 A cruise of Resurrection Bay, which lasts 4-1/2 hours, includes time at Fox Island. The voyage includes opportunities to see marine birds and mammals as the boat gets close to jagged cliffs, alpine glaciers, and Bear Glacier. 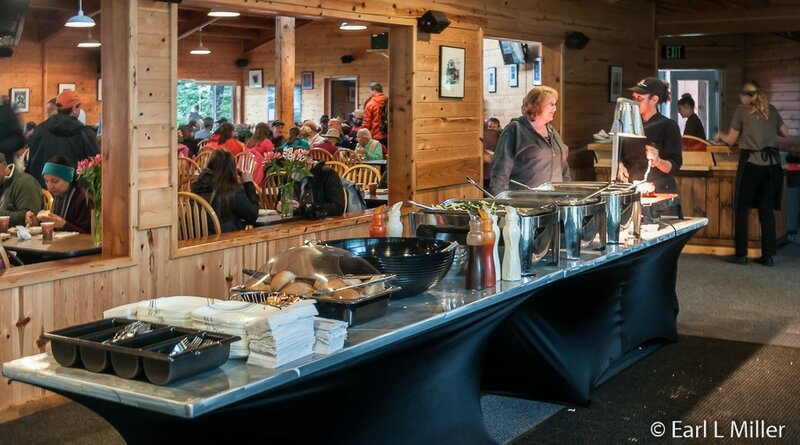 At the island, a national park ranger presentation and the lunch buffet of salmon and prime rib is included. You catch it from May 20 through September 4. The cruise has a noon departure and returns at 4:30 p.m. Price is $ 107 for adults and for $53.50 for children (ages 2-11) plus taxes and port fee. To contact Kenai Fjords Tours, call (877) 777-4051 . Their address is 1304 Fourth Avenue in Seward. For reservations, including details on refunds and cancellation fees, go to Reservations on their site.